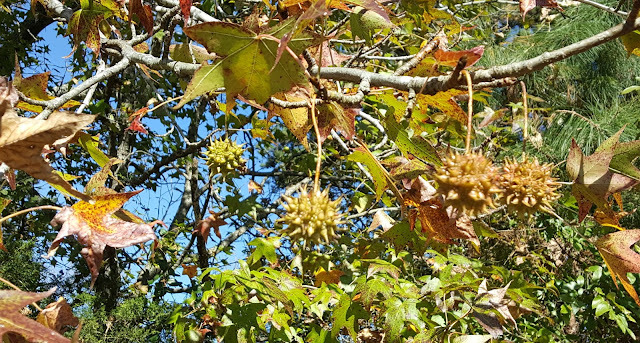 We are now in Sweet Gum tree territory. The fruit looks like little bombs. Inside are little capsules holding seeds. Loved by birds. The trees drop a very sticky sap which can be a pain to wash from your RV. 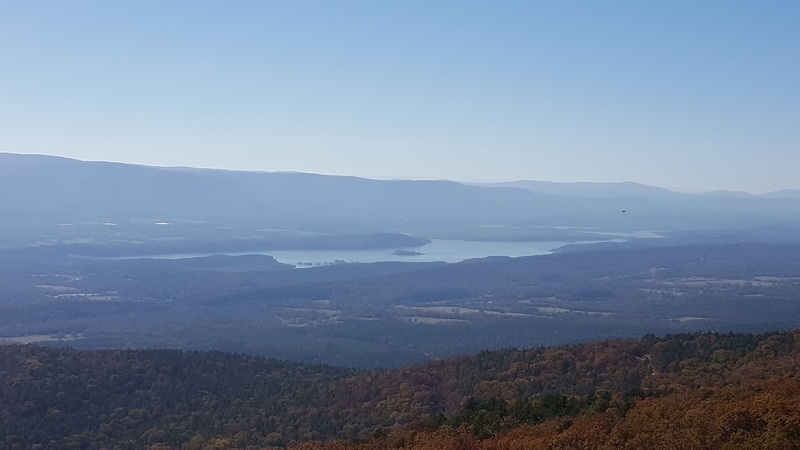 Jan and I stayed here last year and traveled into Heber Springs. There are 13 different COE campgrounds on this lake. We head south on Route 9 to Route 40 again. 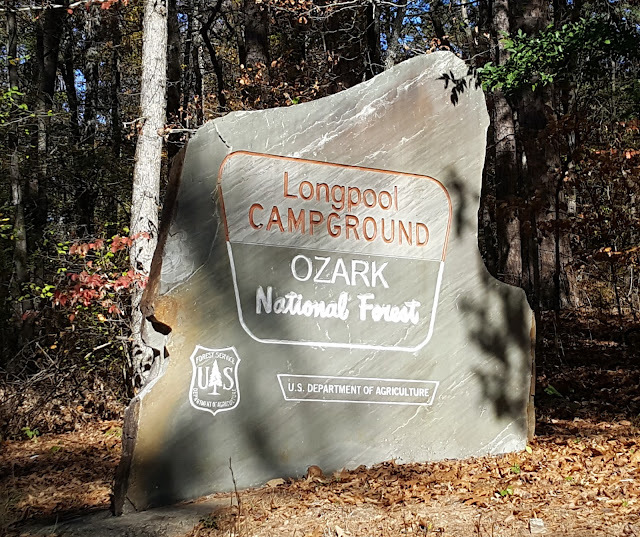 Then north on Route 7, which is one of Arkansas's most scenic highways.West on route 164 brings us to Longpool Campground, an Ozark National Forest Campground. 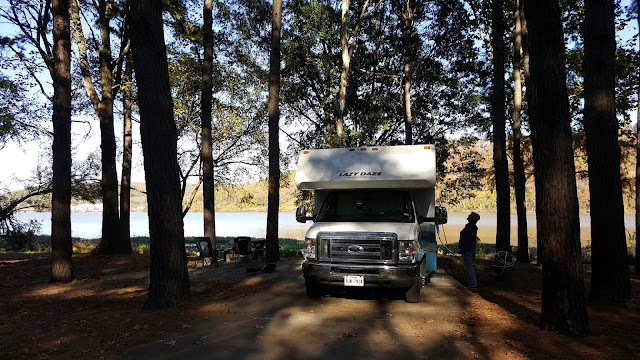 The sites are comfortable and there are a number of campers here. They are here for the opening of hunting season . Normally they also might want to kayak down Big Piney Creek , some 60 miles long, but the water is low right now. 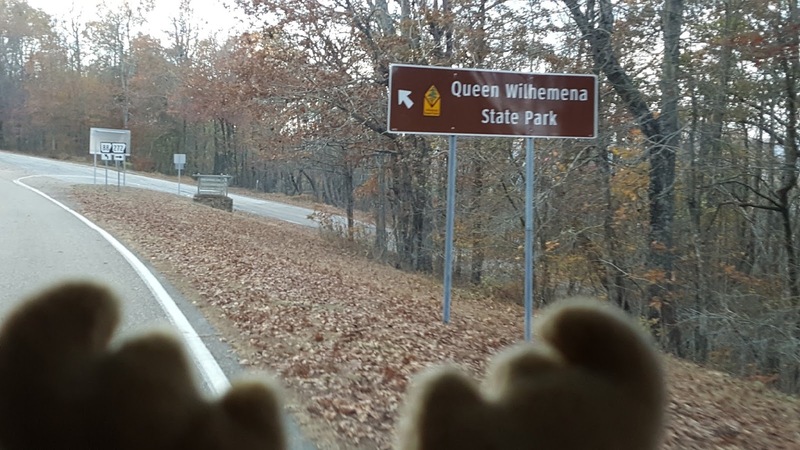 Back to Route 164, west this time, to Clarksville and Route 40 again, west to Ozark. This time it will be Aux Arc COE Campground. Jan and I found the pronunciation is "Ox Ark". 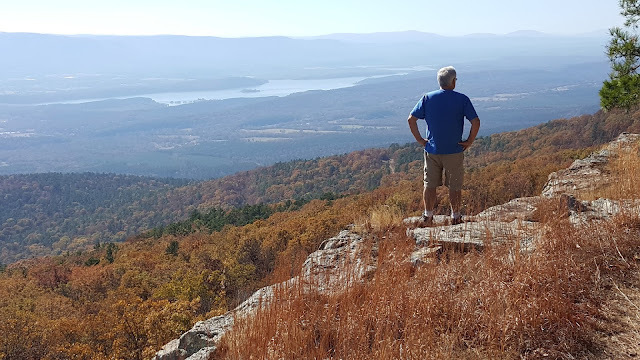 Jan prefers the French Ozark. 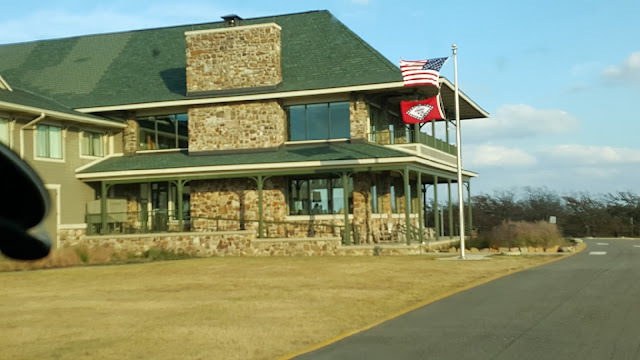 A beautiful site right on the Arkansas River. 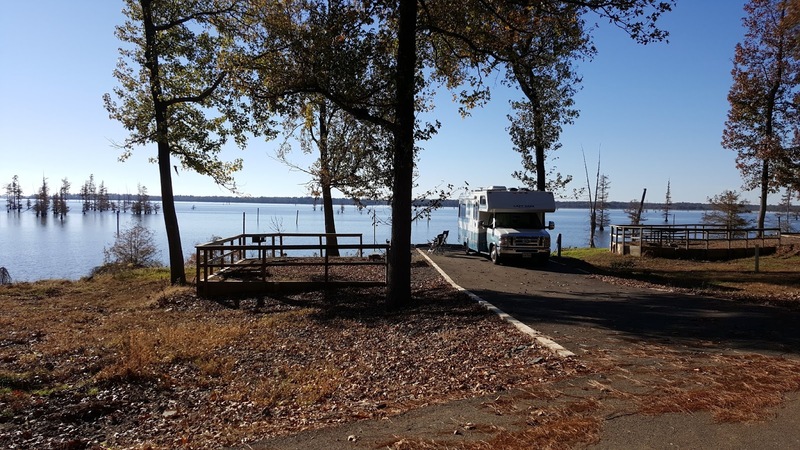 This campground is right at the dam that separates Ozark Lake to the west and Dardanelle Lake to the east. 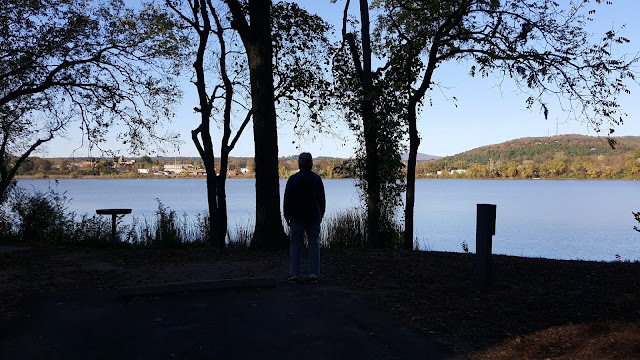 There are locks at the dam, but we only saw pleasure boats using the locks or the river. 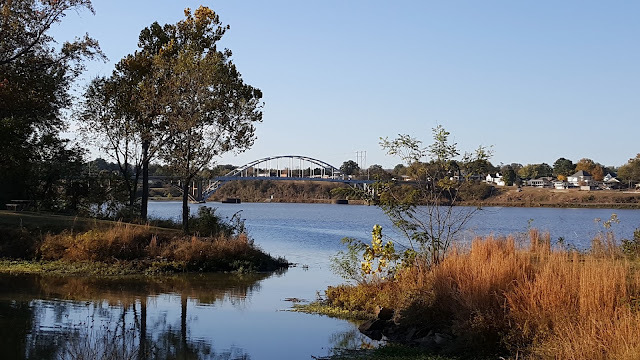 We had crossed this bridge to get to the park. 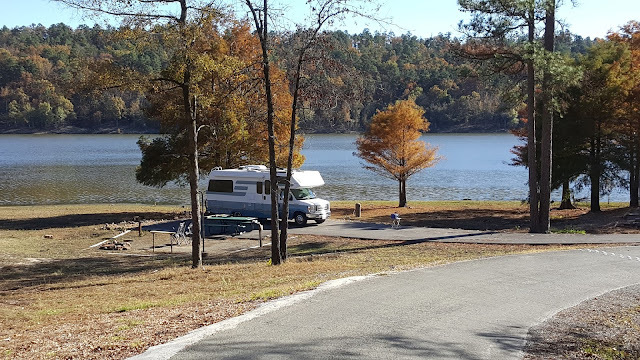 A nice view from the campground. That night was the night of the hunter moon which was also the closest the moon was to the earth since 1948. Unfortunately, there were numerous clouds . 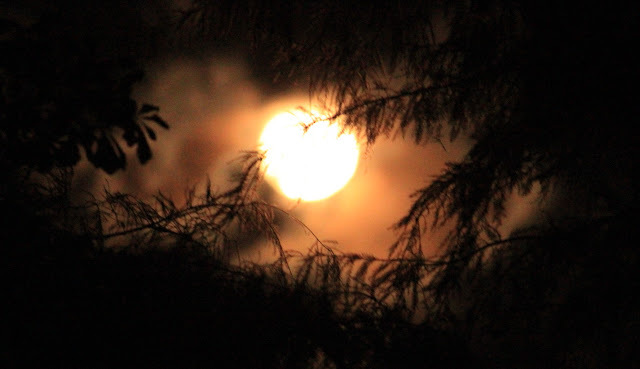 But, the moon poked through for a short visit and we snapped a shot through the tree branches. From Ozark, we follow Route 309 south to Mt. 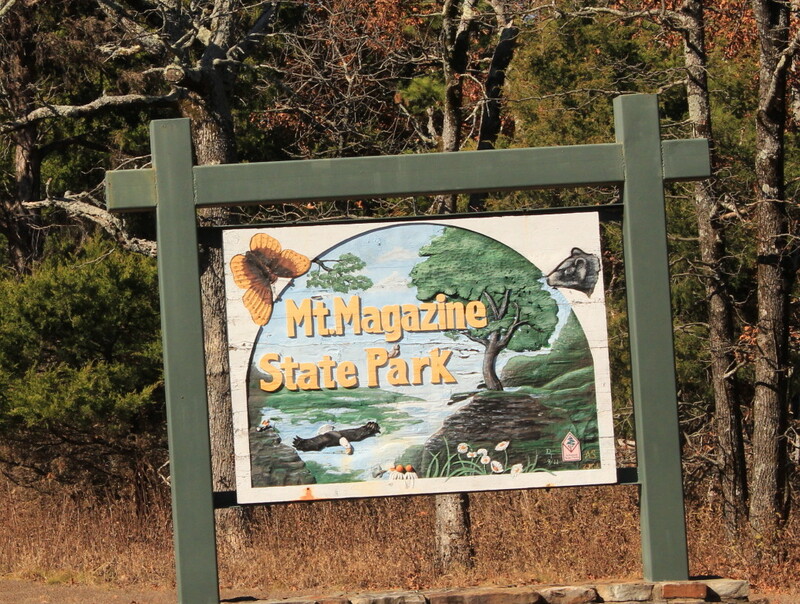 Magazine State Park. Jan and I have really been enjoying these back roads of Arkansas. The roads are in good shape. Some are narrow, but the traffic has been very light. We go by a lot of beef cattle farms, chicken farms(Tyson), and just beautiful rural roads. 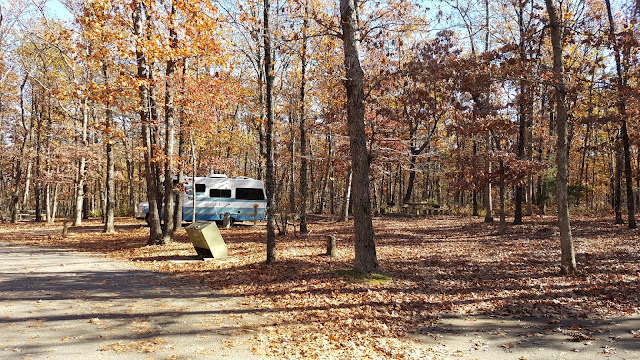 The sites are large and wooded. We are surprised to see a 45 foot Class A motorhome come in towing a trailer. 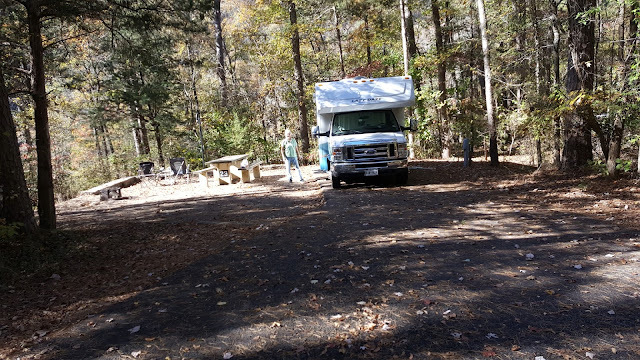 They found a large site also. 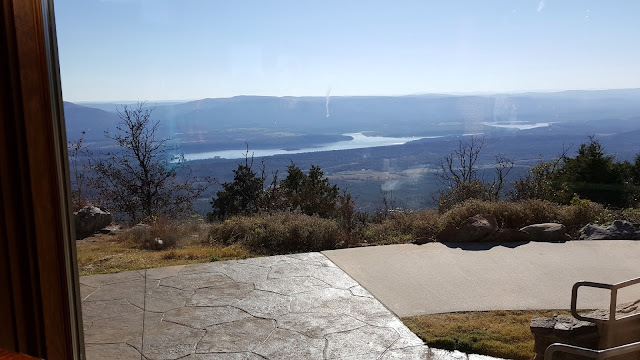 another mile takes us to the Lodge and some really great views. 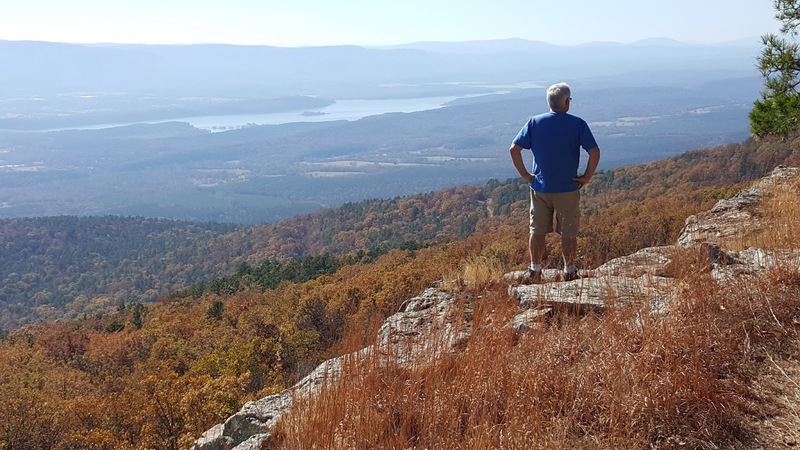 The views include some comfortable looking farms, Blue Mountain Lake, and the Petit Jean River Valley. 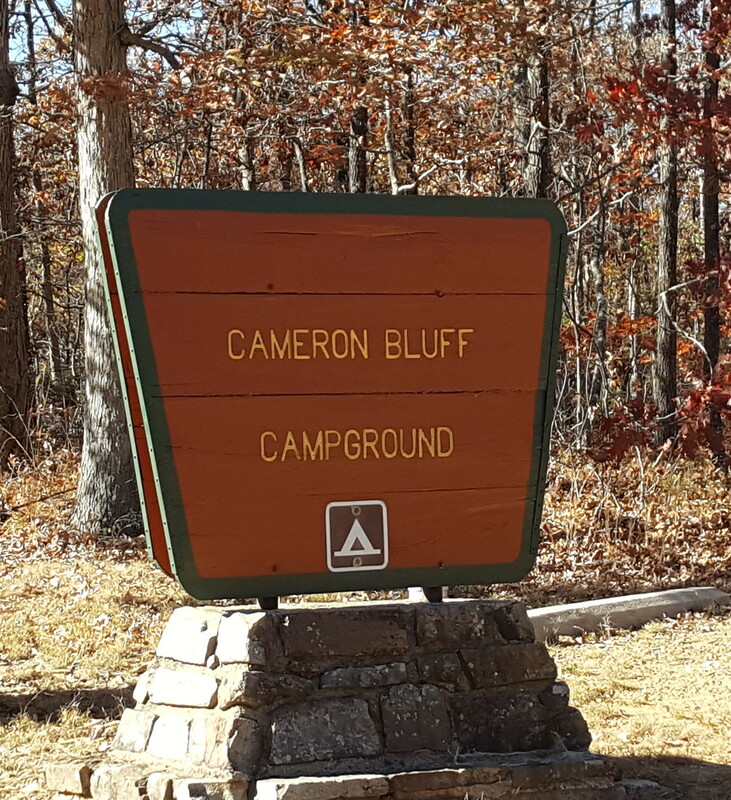 From Cameron Bluff Campground, we drove around the Overlook Drive. If we had more time, we could have biked the route, it is fairly level and little traffic. Jan enjoys the nicely engineered overlook. From the overlooks you can also have good views of the shale and limestone cliffs. Memo to selves. Taking selfies into the sun results in big time squinting. King of the mountain. Master of all he surveys. Nice try , Bruce. In your imagination. 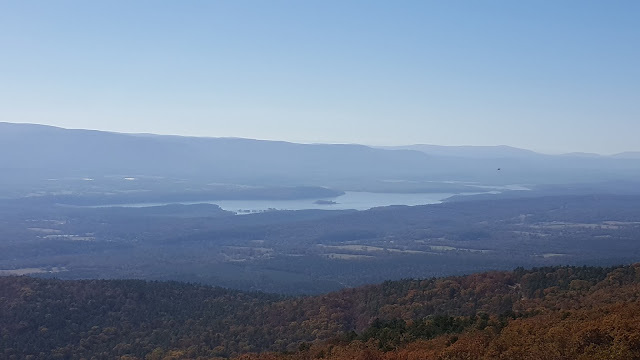 As we point out in the picture from Mt. 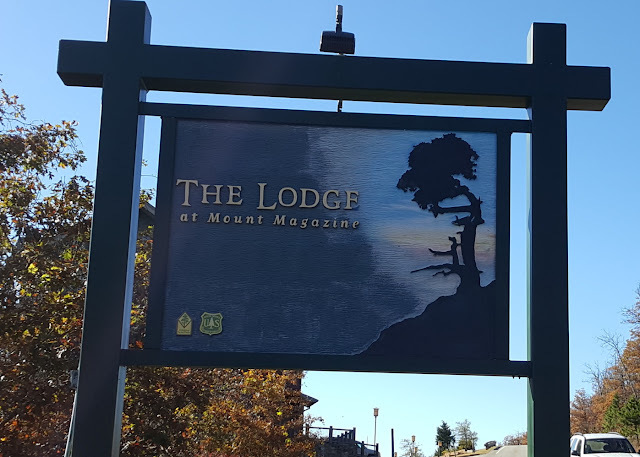 Magazine Lodge, our next stop is Waveland COE Campground at Blue Mountain Lake. 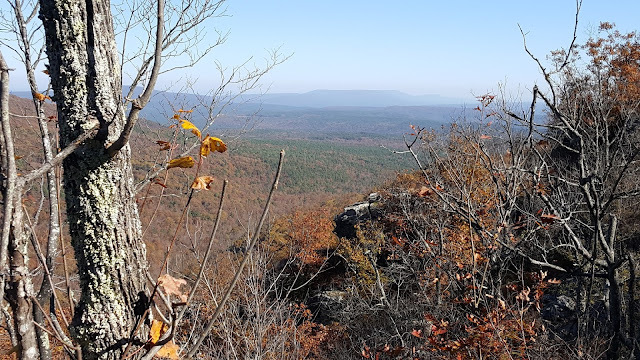 You will have to enlarge this picture, but above on that ledge you will see Mt. Magazine Lodge. Glad we went up, though. 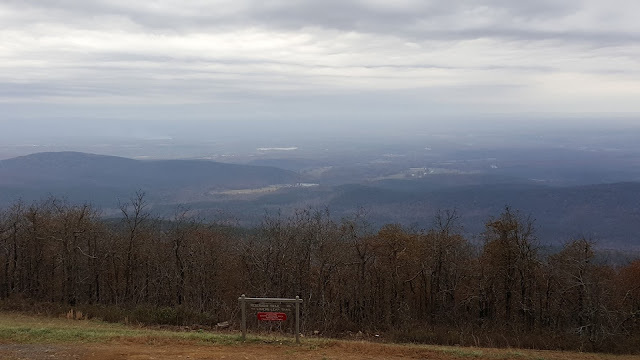 The views were wonderful on the way up. They even have an old steam engine. They also have a small track train that offers rides around the plateau in the summer. 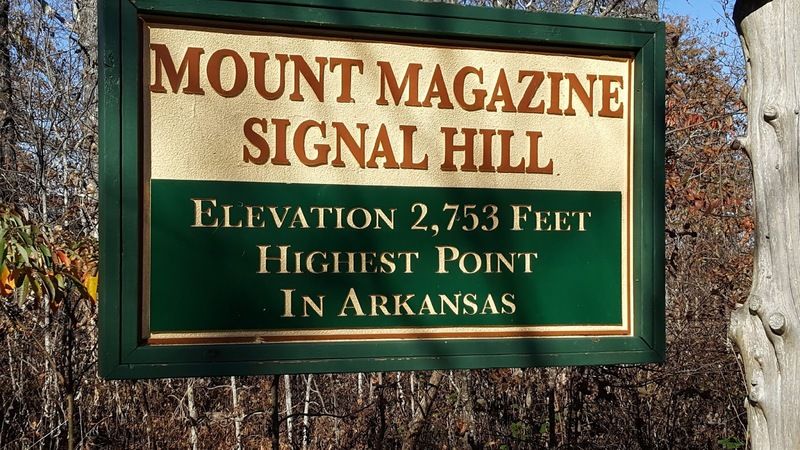 The elevation is 2,681 feet on Rich Mountain, the second highest spot in Arkansas. This was a warm , more humid day. But the views were still quite impressive. 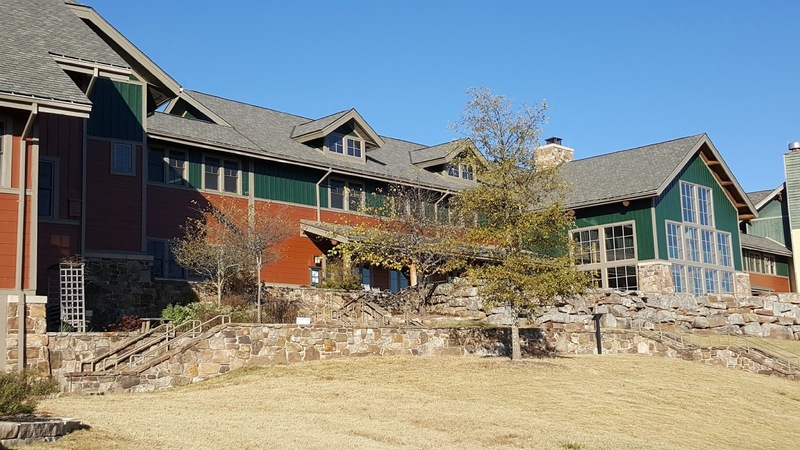 This is another recently renovated State Park Lodge.Follow this link to see more about Queen Wilhelmina Queen Wilhelmina State Park .You will note that the name is a result of Netherlands investors who wanted to name the park after their young queen. We came up here in shorts , but awoke to temperatures in the forties and quite windy. 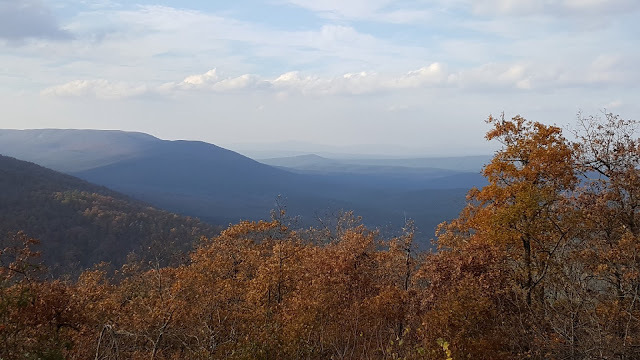 Route 88 back to Route 71 still offers great views. Just don't take your eyes off the road. We were only about 5 or 6 miles from the Oklahoma border at Queen Wilhelmina. 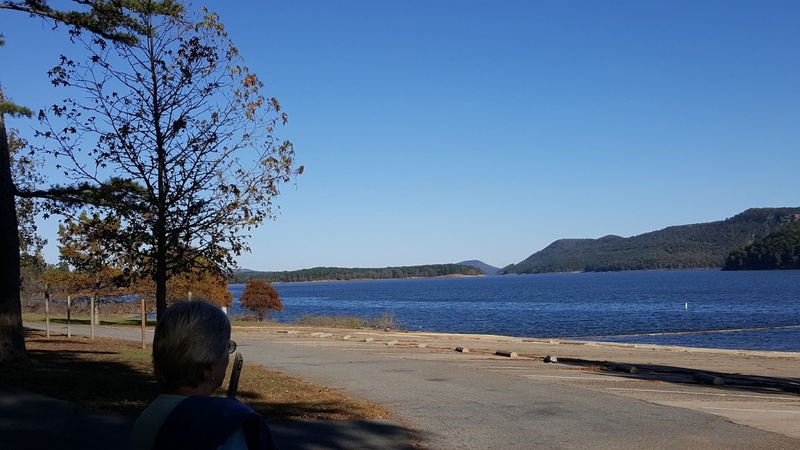 Back on Route 71 we head south to a group of three Corps lakes. 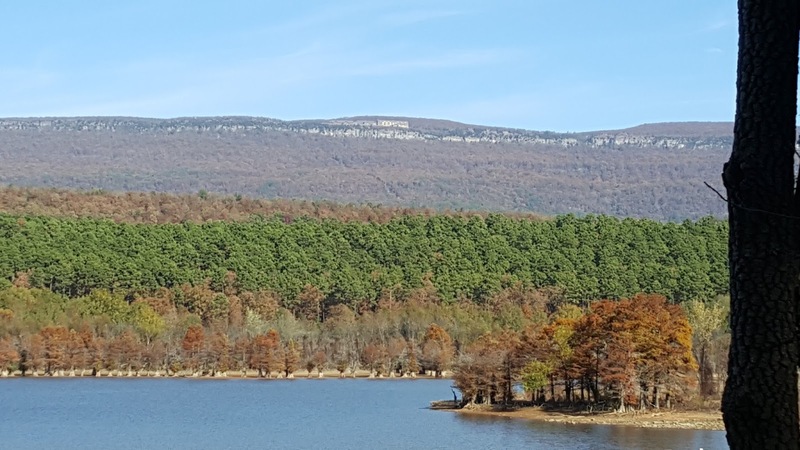 De Queen Lake, Gillham Lake, and Dierks Lake. We take time to look at campgrounds on De Queen , but are not happy with the sites and the campgrounds. 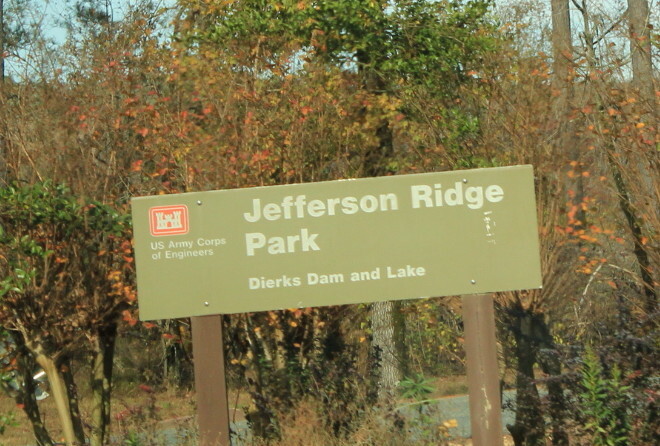 So off we go to Dierks Lake. Much happier at Jefferson Ridge. 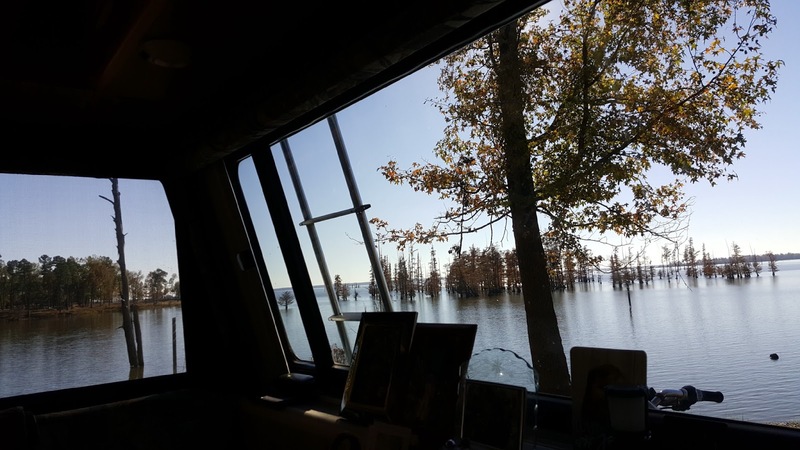 Our site has plenty of privacy and a great lake view. We follow Route 71 to Route 371 to Route 355 and Millwood Lake and Cottonshed COE Park. We were a bit skeptical on the road here--a little desolate and very remote. Nice, level, large sites. 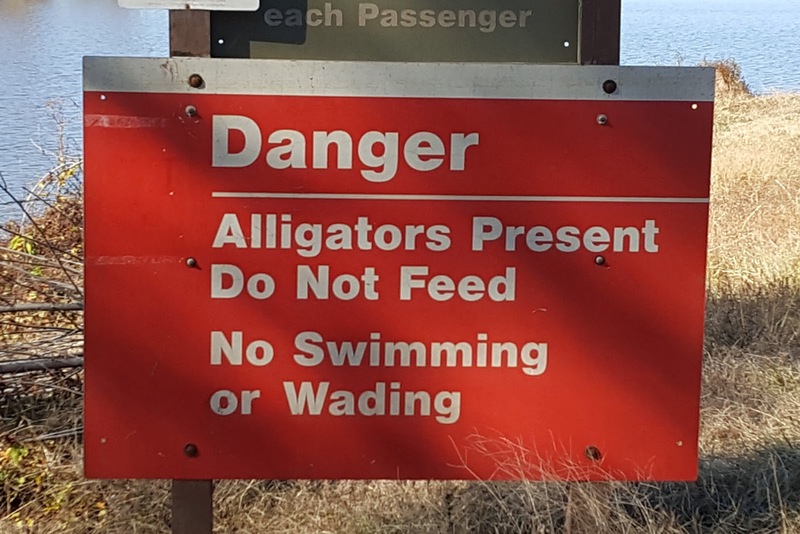 Everyone here is either hunting or fishing. 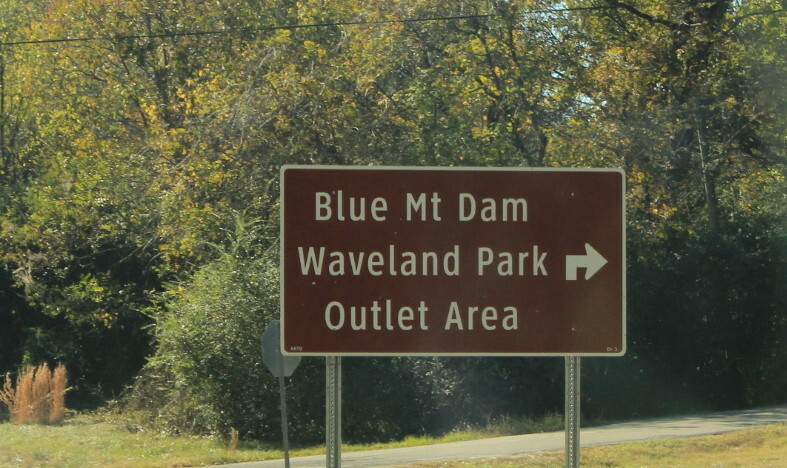 We can tell we are south when we start seeing these signs. 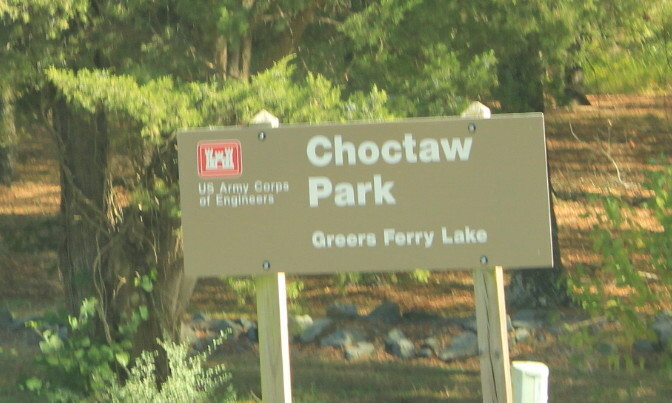 The trees are the Bald Cypress that have knobby knees around the base of the trunk and are quite happy to grow in the water. It must be close to Thanksgiving if Jan is preparing Lanttulaatikko, a Finnish turnip casserole. By the way, you might have noticed that we changed the font type size to large. Hope this is better. Let us know. Your blog is very readable and entertaining. 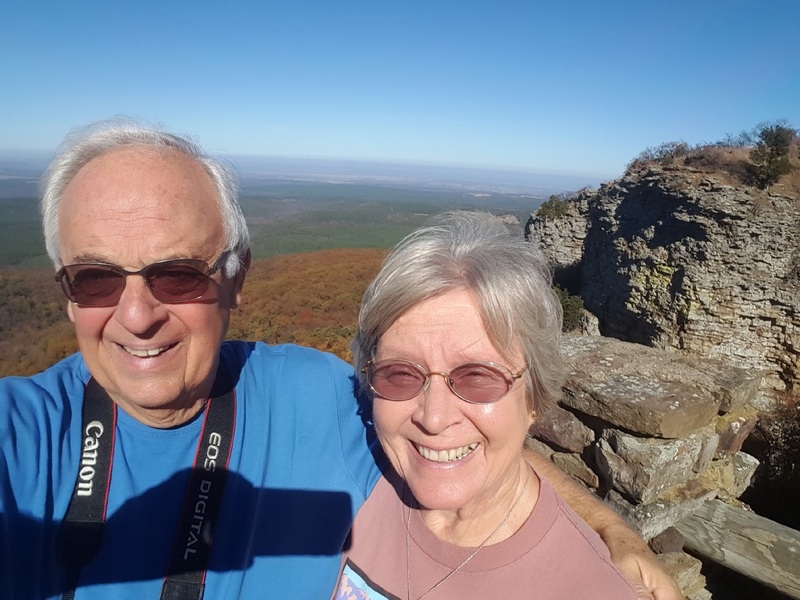 Glad to hear from you Ed and Carol. Hope all is well. Might we see you in Quartzsite?